You may only use gold from the losing opponent's gold pool to pay for Loot. Reaction: After you win an unopposed challenge, discard the top X cards from the losing opponent's deck. 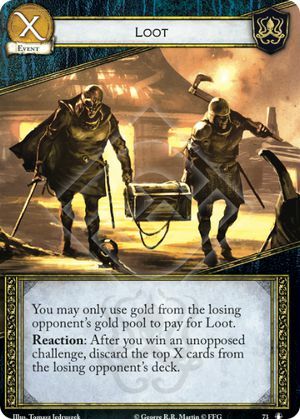 The value of X is defined before any discounts are applied, so you may use Tourney Grounds, Paxter Redwyne, and Littlefinger's Meddling to discard more cards from the opponent's deck than the amount of gold in that opponent's gold pool.